G. K. Chesterton once wrote, “Though St John the Evangelist saw many strange monsters in his vision he saw no creature so wild as one of his own commentators” (Orthodoxy [New York: John Lang, 1908], p. 19). Chesterton’s commentary on commentators highlights the wide-ranging ways in which the book of Revelation can be read. The contributors to this volume recognize the staggering interpretive spectrum that the last book of the Bible typically generates and seek to provide a framework for navigating this apocalyptic terrain. These nine essays were first presented at a conference held at Duke University in 2010. Editors Richard B. Hays of Duke Divinity School and Stefan Alkier of Johann Wolfgang Goethe-Universität decided to publish the essays in the order they were originally presented. After the introduction, Michael J. Gorman discusses the reception history (or “impact history”) of the book of Revelation. Gorman explains that the reception/impact history of a text takes into account “a broader range of responses and effects—in and upon music and other arts, politics, liturgy, Christian practices, and so on, as well as on theology” (p. 13). This line of inquiry is especially appropriate for studying Revelation, as this work “has given rise to a wonderful, if sometimes bizarre, story of reception and impact” (p. 16). The “incredible multivalence” of interpretive responses to Revelation flows from the book’s symbolism, hybrid of genre characteristics, highly intertextual character, its “symbiosis of otherworldly and this-worldly phenomena,” and its position and function in the canon (pp. 18-20). The presence of these factors within the scope of one composition, Gorman observes, “creates a perfect storm for polyvalence” (p. 20). In the next essay, Steve Moyise investigates various “models for intertextual interpretation of Revelation” (pp. 31-45). In intertextual theory, “texts are not viewed as isolated units of meaning but are interpreted in the light of other texts (canon) and traditions (‘rule of faith,’ creeds)” (p. 31). Moyise delineates the major options for understanding John’s use of other biblical texts. Some interpretations focus on the author’s intertexts (e.g., Gen 1-3, Dan 7) while others focus on the reader’s intertexts (e.g., apocryphal writings or canonical texts John does not draw upon). Moyise surveys the work of scholars across this spectrum and highlights the echoes of intertextuality they have uncovered. He concludes by affirming the value of “naming the intertexts and the weight that is being accorded to them” (p. 45). This methodological transparency, Moyise contends, will help readers sift through the sometimes wildly divergent readings of the Apocalypse. The essays that follow investigate specific aspects of John’s compositional strategy. Thomas Hieke examines the importance and reception of Daniel 7 throughout the book. Richard Hays lays out the intertextual matrix by which John characterizes Jesus as the “faithful witness” and the “Alpha and Omega.” Through intertextual narration, Hays highlights, John paradoxically portrays Jesus as one who shares in the divine identity yet still suffers to create a redeemed community of worshipers. Joseph Mangina highlights the role of the ekklesia in the Apocalypse and examines the mysterious relationship between Israel and the church as the one people of God. With a slight shift of emphasis, N. T. Wright outlines the present political implications that John’s Revelation has for the notion of Christian hope. For Wright, John’s message is that “the coming of God’s kingdom on earth as in heaven” has “already been inaugurated through the victory of the sacrificed Lamb who is also the Lion” (p. 106). In a similar vein, Stefan Alkier seeks to explain how Revelation “can help Christians live their political lives” (p. 125). Alkier’s thesis is that “Revelation’s pragmatic model of Zeugenschaft (witness) could be a political model for Christian life today” (p. 127). In short, Alkier avers that the Apocalypse encourages its readers to remain witnesses rather than warriors (p. 127ff.). Tobias Nicklas follows these essays by considering the Apocalypse within the “framework of an already existing canon” (p. 143). Nicklas asks, “What is the import of Revelation’s voice in the ‘choir’ of voices we hear in the canon of the Christian Bible? What would be missing if the Apocalypse did not stand at the end of the canon of Old and New Testaments?” (p. 143). The Apocalypse, argues Nicklas, provides a distinctive tenor to the New Testament’s witness to God’s action in the world, the church’s role in society, the relationship between the Testaments, and God’s faithful yet mysterious relationship with his people. In sum, “the Christian Bible would lose a decisive dimension without Revelation” (p. 151). 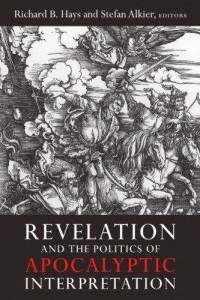 Marianne Meye Thompson concludes the volume with a series of reflections on the “theological interpretation of the book of Revelation today” (p. 155). For her, “What we are interested in is interpretation of certain kinds of texts, namely, theologically interested texts” (p. 159). More specifically, she considers “how we might allow the book of Revelation itself to shape our understanding of theological interpretation” (p. 161). Readers of the book are “not only to see what John sees or to hear what he heard, but also to see as John sees, and to hear as John hears” (p. 164). Thompson argues that “John calls not for sight but for insight, not just for hearing but for understanding” (p. 164). For Thompson, this understanding can take place when readers view the book as a word addressed to them, as a message designed to renew their minds, to invoke their worship, and to be read within the context of the canon. The dialogue in these presentations demonstrates the eclectic array of interpretations that the book of Revelation is capable of provoking. Assembled here are textual, theological, historical, and ideological/political insights, and most of the contributions have a mix of these elements. There are also valuable introductions to the disciplines of reception history (pp. 13-16), intertextuality (pp. 31-33, 138-40), and theological interpretation (pp. 158-61). Further, the first two essays provide a helpful hermeneutical orientation to the various issues raised in the subsequent discussions. Within this broad diversity, Hays and Alkier argue that the essays “embody a significant convergence of perspective” that shares “an appreciation for the symbolic and ‘theopoetic’ power and complexity of the Apocalypse, a resistance to narrowly literalistic predictive readings, a disposition to read the text as calling followers of Jesus to nonviolent resistance of secular power, and a deep engagement with the Christocentric message of the book” (p. 9). While each analysis maintains its distinctive features, these interdisciplinary essays do bear this methodological family resemblance. The volume as a whole is thus a substantive example of the reception history of Revelation that it seeks to describe. The contributors present a compelling case that there are real political implications in the interpretation and identification of the main message of the Apocalypse (pp. 1-2, 8-9). For instance, Gorman characterizes Revelation as “a theopolitical text” (p. 27). This is true, he says, “because the heart of Revelation is worship, and worship is a theopolitical practice” (p. 27). However, the book lacks a direct interaction with the method and nature of ideological or political interpretation. The essays demonstrate that the Apocalypse has political implications but some readers might have lingering questions about the nature of political interpretation. Indeed, discussion of the intertextual references woven into the fabric of John’s composition and the question of their canonical function is more prominent than the title suggests. Even the two overtly political essays draw extensively on intertextual connections to make their point. More specifically, in this volume there is an assumed connection between the study of intertextuality and the question of canon. Hays and Alkier note that “to ask about the role of the book of Revelation within the canon, we must consider not only how the author may have been influenced by his sources and precursors; we must also consider literary issues about the interplay of images, and we must assess the theological impact of the juxtaposition of diverse ways of conceptualizing God’s action in history” (p. 3). They are convinced that “in order to understand the Apocalypse well, we need to understand the complex way in which the author is reading these books and employing their ideas and images” (p. 5). This textual emphasis on the connective nature and canonical function of John’s compositional work is a welcome feature of a substantive and thought-provoking collection of essays. Also in JETS 56.2 (June 2013): 445-48.